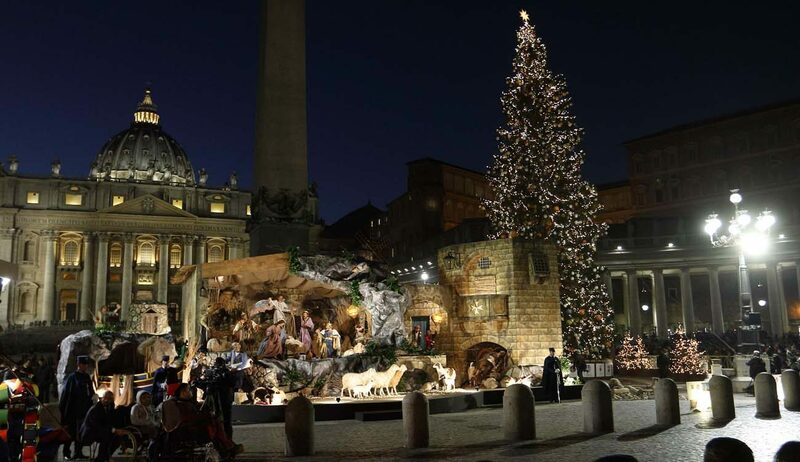 VATICAN CITY (CNS) — The Vatican’s Christmas tree and Nativity scene will feature traditional designs and decorations centered on the theme of mercy. A towering 92-foot spruce tree will be the centerpiece of the Vatican’s Christmas holidays, according to a note released Oct. 25 by the governing office of Vatican City. The tree, which measures nearly 33 feet in diameter, will be donated by the Archdiocese of Elk, Poland, and transported to the Vatican on a flat-bed truck traveling over 1,240 miles across central Europe, the Vatican said. Covering a surface of over 860 square feet, the Nativity scene will be “inspired by the works of mercy” and will feature 20 terracotta figures, some as tall as 6 feet, the governing office said. As it was last year, the Christmas tree will be adorned with ornaments made by children receiving treatment at several Italian hospitals. “These children, with their parents, participated in a ceramics recreational therapy program” organized by the Countess Lene Thune Foundation, which provides therapeutic recreation to young boys and girls suffering from oncological and hematological disorders, the Vatican said. Additionally, children from the central Italian Archdiocese of Spoleto-Norcia, which was devastated by earthquakes in 2016, will also make ornaments for the Christmas tree. Several of the children and a delegation from Poland will meet with Pope Francis at an audience the morning of Dec. 7; that evening, the Vatican will hold a tree-lighting ceremony.